Armin van Buuren tries again with "Turn It Up" ! Home Trance News Armin van Buuren tries again with “Turn It Up” ! Armin van Buuren wants to continue to make us jump to the rhythm of Psy Trance music ! 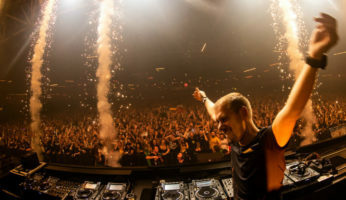 The Dutch legend never ceases to surprise his audience: after extraordinarys versus (the last one with Above & Beyond for “Show Me Love”) and many collaborations, as well as new personal single releases, always during the Utrecht live for A State Of Trance 900, Armin van Buuren played his next single “Turn It Up” for the first time. It’s obviously a clear follow-up of last year’s super-hit “Blah Blah Blah” that broke numerous records of permanence in the Beatport charts and also of visualizations on Youtube of the video-lyric (over 270 million), how we had the opportunity to talk here “Blah Blah Blah” will rewrite the story ?. Tonight the dj officially presented the single during his radio show as “Tune Of The Week” and we can say that just as he blew us live during the Dutch performance he produced the same effect listening to her live tonight: a mixed of Psy-Trance with a touch of EDM that has been able to unite the most purist trance fans with those with the most commercial ear. Will he reach the glories of “Blah Blah Blah” ? All that remains is to wait, jump … and find out !